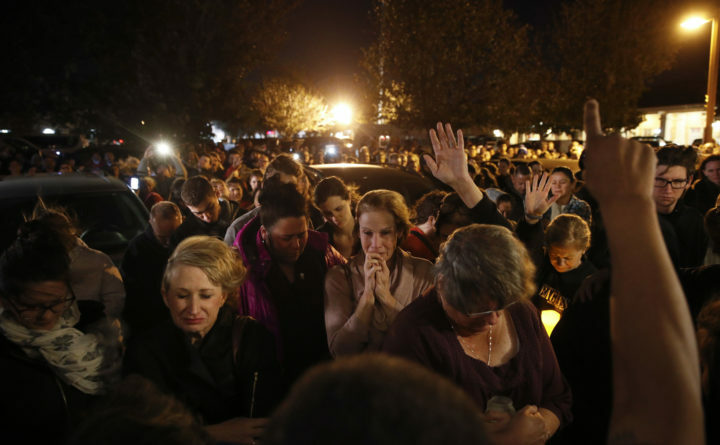 People gather outside the Rivalry Roasters coffee shop for a vigil for Sean Adler Thursday, Nov. 8, 2018, in Simi Valley, California. 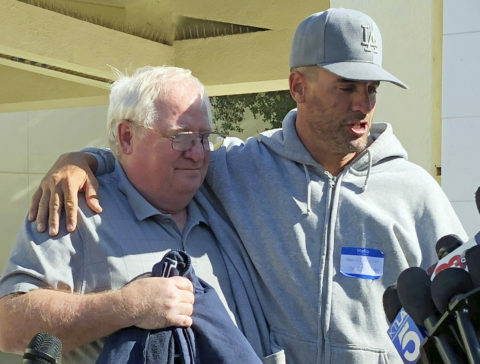 Jason Coffman, right, talks to the media about his son, Cody Coffman, who died in the shooting, and holds onto his father-in-law, Mike Johnston, in Thousand Oaks, Calif., Thursday, Nov. 8, 2018. Cody Coffman was an athlete, umpire and big brother who had planned on joining the U.S. Army before he was killed, said his father, Jason Coffman. “He was on his way to fulfill his dream of serving the country,” the father said outside the Thousand Oaks Teen Center, where families gathered. At times, he was so overwhelmed he could not speak, leaning on his father-in-law to steady himself. He said Cody had just moved in with him and was an older brother to 6- and 8-year-old boys. Jason Coffman’s wife is expecting a daughter at the end of the month, and Cody was thrilled at the prospect of having a sister. Teylor Whittler, 19, was a high school friend of Cody’s and said she was with him at the bar Wednesday night. She said the two of them were paired up for a rally when she was a cheerleader and he was a football player. Jason Coffman said that he coached his son’s baseball teams starting when Cody was a little boy and that Cody was the head umpire in a local baseball league. The father and son were very close, playing baseball and fishing together. The Conejo Valley Little League in Thousand Oaks mourned Cody’s passing on Twitter. “Hug your players close tonight, as Camarillo Pony Baseball mourns the loss of former player, [and] current umpire,” the league wrote. Helus had served nearly 30 years with the force and was one year from retirement. 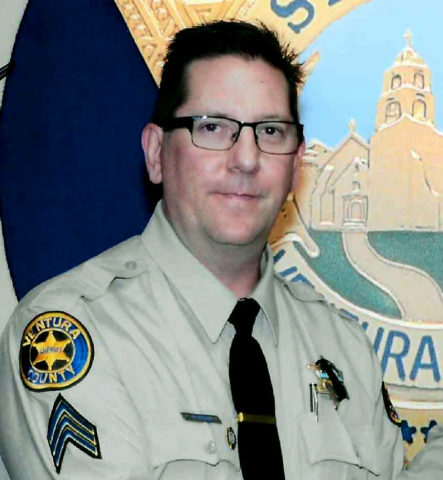 His colleagues reacted with “utter disbelief” to his death, said Ventura County Sheriff’s Sgt. Eric Buschow. 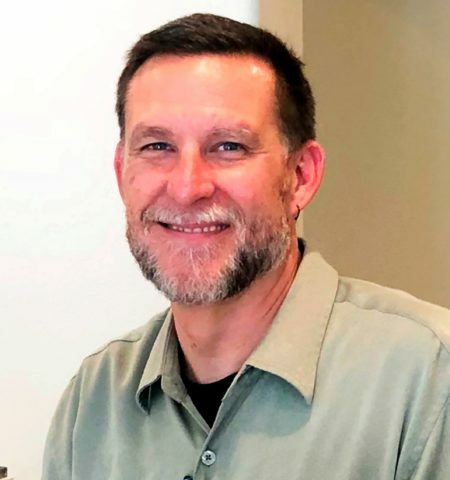 Helus lived in Moorpark, California, and was an avid outdoorsman whose Facebook page was full of photos of snowy mountains, fishing trips, waterfalls, the serene waters of the San Joaquin River and family. On some backcountry trips, he would see more bald eagles and deer than people, he said on Facebook. “I’ve probably had 200 bear and 3 mountain lion encounters,” Helus told a Facebook friend, who jokingly asked if he were part animal. Now, training emphasizes aggressive pursuit of suspects before they kill more people or target those already wounded. 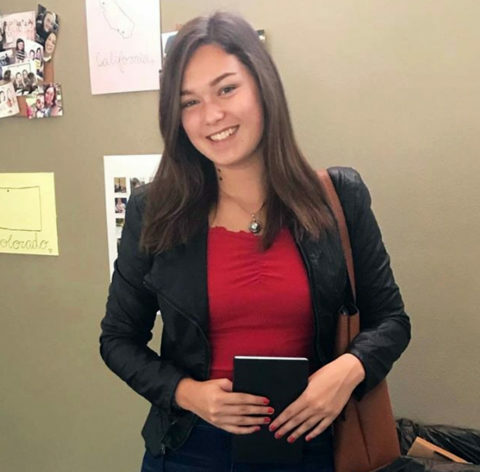 This undated photo provided by former Fox News correspondent Adam Housley and his wife, actress Tamera Mowry-Housley, shows their niece, Alaina Housley, a Pepperdine University freshman who was among those killed in the shooting at the Borderline bar in Thousand Oaks, Calif.
On social media, Alaina Housley portrayed an idyllic college life at Pepperdine University, which sits not far from the beach in picture-perfect Malibu, California. She had just started school there and appeared to have nurtured a strong network of friends. Her uncle, former television reporter Adam Housley, confirmed that Alaina Housley was among those killed. Her death was also confirmed by Pepperdine. “Our hearts are broken with the news of this profound loss,” the school said on Twitter. Before she arrived on campus in the fall, she posted a high school graduation photo to Facebook. Marcia Battat has known Housley and her family for many years, and recalled teaching her piano beginning at age 5. A friend replied with remembrances of Housley’s childhood. “Gee it seems like yesterday when you started piano lessons with me at 5 years old!! Would love to hear what your future plans are set for? Whatever you do I know that you will be a great success always! !” the friend wrote. Manrique also knew how to have fun. His hobbies included hiking, biking, photography, learning the craft of brewing and watching the Los Angeles Dodgers, according to a bio posted online by Team Red, White & Blue. This undated photo provided by Channel Islands Social Services shows Justin Allen Meek, 23. Meek was one of the victims of a gunman's rampage at the Borderline Bar in Thousand Oaks, Calif., late Wednesday, Nov. 7, 2018. She said Meek had a passion for doing what was right, so she wasn’t surprised he took action to protect others at the bar. Meek was planning to join the U.S. Coast Guard, Zimmerman wrote, a compromise between his Air Force veteran mother and his Navy SEAL father. On his Facebook page, Meek had a photo of himself playing guitar, and said he studied criminal justice at Cal Lutheran. Kimball said the campus would gather at 11:25 a.m. Thursday in Samuelson Chapel to mourn. At 6 and at 7:30 p.m. in the same chapel, there will be a Catholic Rosary and then a campus gathering. “We will pray, begin to comfort one another in our grief, and hold the families, friends and loved ones of the victims in our hearts,” he wrote. “Cal Lutheran wraps its arms around the Meek family and other families, and around every member of this community of caring,” Kimball said. Sparks was at the church for an event for students Wednesday night, he said. True to form, Sparks was one of the last to leave, before heading to the Borderline Bar & Grill, according to Travis. Staff members at Calvary shared memories of Sparks on Thursday, recalling how much she loved the church community and working with children, Thornton said – and how much she loved to go line dancing. This undated photo provided by Debra Ross shows Sean Adler. Adler was one of the victims of a gunman's rampage at the Borderline Bar in Thousand Oaks, Calif., late Wednesday, Nov. 7, 2018. So at 48, according to the Acorn, he chased a new dream: becoming an entrepreneur. He and a business partner opened a coffee shop in Simi Valley, California. Less than a month ago, Rivalry Roasters held its grand opening. His voice quiet and cracking, Dan Dingman said his family found out late Thursday that their 21-year-old son – Blake Dingman – died in the Thousand Oaks shooting. He lived with his parents and sister, a tightknit family, she said. His favorite things to do: riding dirt bikes, working on his truck and hanging out with friends. He even rebuilt a diesel truck using only instructions from the Internet – and he loved to race it. Over the Fourth of July holiday this year, she said, he went to the lake with buddies, took out a ski boat and hoisted a huge American flag. 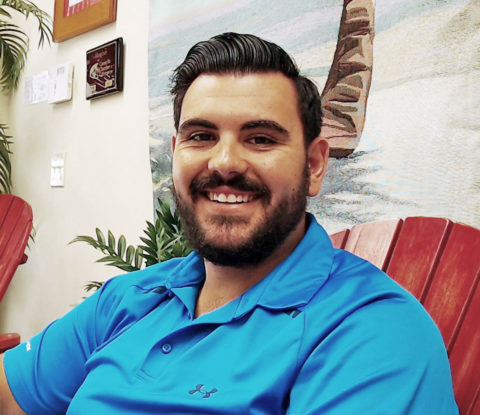 Mark Meza was a friendly, outgoing employee who had a great rapport with everyone at the Sandpiper Lodge, a Santa Barbara, California, hotel where he worked as a housekeeper. “He was an extremely nice young man, extremely personable,” said Shawn Boteju, the hotel’s general manager. 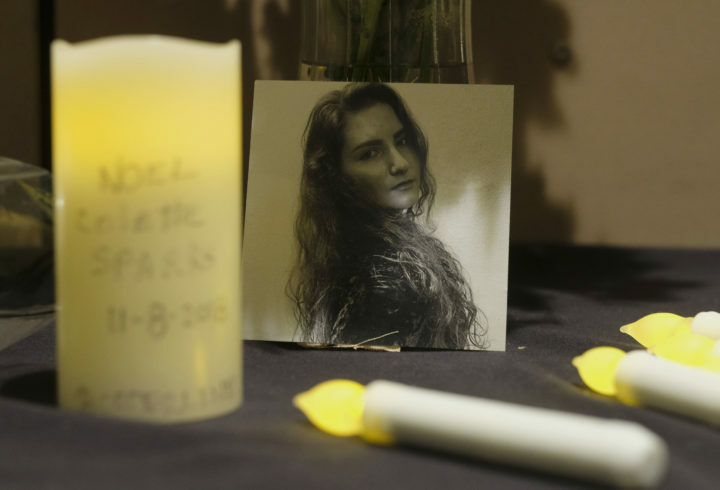 Joseph Kaesberg, 19, a friend since high school, recalled that Morisette was always there when friends needed her – like the time he had to put down his dog. Morisette called and texted to check on Kaesberg and asked if he wanted to grab lunch or dinner, just to get out of the house. Telemachus Orfanos was a Navy veteran who survived last year’s mass shooting at a country-music festival in Las Vegas only to perish in a hail of bullets at the Borderline Bar & Grill. His father, Marc Orfanos, described his son, who went by “Tel,” as a gregarious and kindhearted young man who made friends easily and traversed the globe in search of new experiences. When he was in training in San Diego, he and his friends would hop on the train and head up to Thousand Oaks to stay at his family’s home for the weekend. “His buddies would crash on the floor,” recalled his 63-year-old father, a semiretired substitute teacher. Mark Wermers, the scoutmaster of Orfanos’s Boy Scout troop, recalled him as a quiet but hard-working and dedicated teenager. Wermers said Orfanos was principled and lived his life by Boy Scout values. He said he imagined Orfanos was helping people in his final moments.